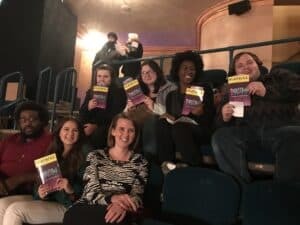 Spring Break 2019 was a memorable experience for a group of WPU Musical Theatre seniors as they made their pilgrimage to Broadway in New York City. With support from the WPU Theatre Department and an Immersive Learning Initiative Grant from WPU’s Center for Immersive Learning, these students flew to the Big Apple to experience live musical theatre at its finest. Students had the opportunity to see two Broadway shows, the smash-hit comedy, The Prom and the world-famous musical, The Phantom of the Opera. Students also had the opportunity to sharpen their performance and audition skills by taking part in a masterclass with David Ebert. Ebert is an actor, director, and writer living and working in New York City. Learning hands-on with professionals is an invaluable experience for students in any major as they begin to plot their course for life after graduation. Students were accompanied on the trip by Amy White, who is an Assistant Professor of Theatre and Musical Theatre at WPU. As well as taking in shows and learning from a masterclass, White took the group for a chance to audition for professional productions from across the country. Immersive learning trips such as these support the mission of the Center for Immersive Learning, which is to enhance student learning and engagement by envisioning student experiences that immerse them in their fields. Faculty across the University have developed amazing activities, trips, and experiences that connect students to the disciplines in exciting ways.